Can You Substitute Quick Cook Oats for Rolled Oats in Baking? Add raisins or chopped nuts to a bowl of hot oatmeal. 2 How Many Calories Do Oats Contain? According to Ohio State University Agricultural Research and Development Center, slow- and quick-cooking oatmeal are equally nutritious. This means that on a hectic morning, a bowl of steaming hot instant oatmeal constitutes a healthy breakfast, and for busy moms, no guilt is required. The main difference between slow- and quick-cooking oatmeal is in the processing. With the exception of steel-cut oats, all oatmeal is steamed lightly as part of processing. Steaming deactivates enzymes, resulting in a longer shelf life. Once the oatmeal is steamed, the grains are flattened with a roller. All parts of the oat are still present. Because instant oatmeal is very thin, cooking involves only stirring hot water into the oats. While instant oatmeal contains the same amount of fiber and nutrients as slow-cooking oatmeal, it's important to read the label. Often, instant oatmeal contains artificial flavorings, sweeteners or sodium. Instant oatmeal also tends to be more expensive than other varieties. Quick-cooking oatmeal is an in-between option. The oats are rolled slightly thicker than instant oats, and the cereal takes about a minute to cook. Old-fashioned oats are coarser, as the oats aren't rolled as thinly as instant or quick-cooking oats. As a result, cooking time is about five minutes. Generally, quick-cooking and old-fashioned oatmeal is packaged with no added flavorings, sugar or sodium. Steel-cut oats are the coarsest of all oat varieties, as they aren't rolled, but are cut into small chunks. As a result, cooking time is about 30 minutes. The texture of steel-cut is chewier than rolled oats, and the flavor is slightly nutty. 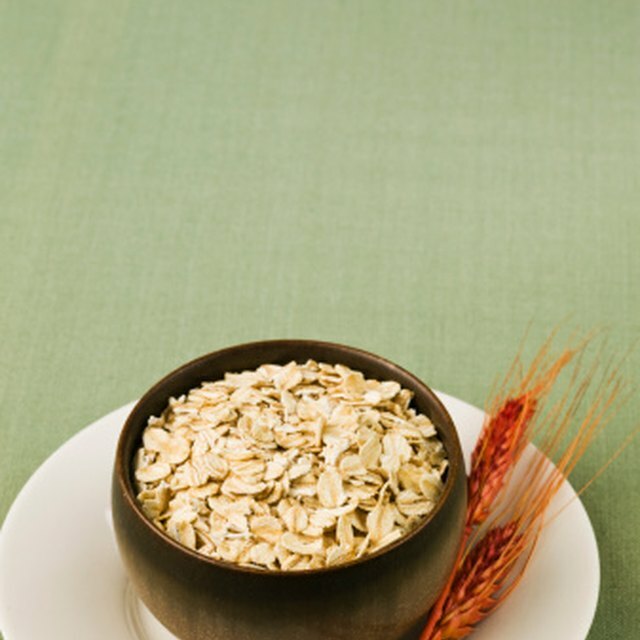 If you like steel-cut oats, save time by cooking a large batch, then refrigerate the cooked oats. In the morning, heat as much as you need. You can also cook steel-cut oats in your slow cooker for about 6 hours. While oatmeal is often cooked with water, cooking the cereal in milk provides additional calcium. You can also ramp up the nutritional content by stirring in a sliced banana or a handful of berries. To sweeten oatmeal, use regular sugar, or opt for honey, brown sugar or maple syrup. A sprinkle of cinnamon provides flavor and natural sweetness, decreasing the need for extra sweeteners. While oatmeal is most often served as a breakfast cereal, the healthy grain is also suitable for mixing in meatloaf, hamburgers, stews, soups, bread, cookies or pancakes. Can I Use Oatmeal for Rolled Oats in Granola?